The long moulder VIPAVA RR is designed for moulding loaves of rye and rye-wheaten dough. 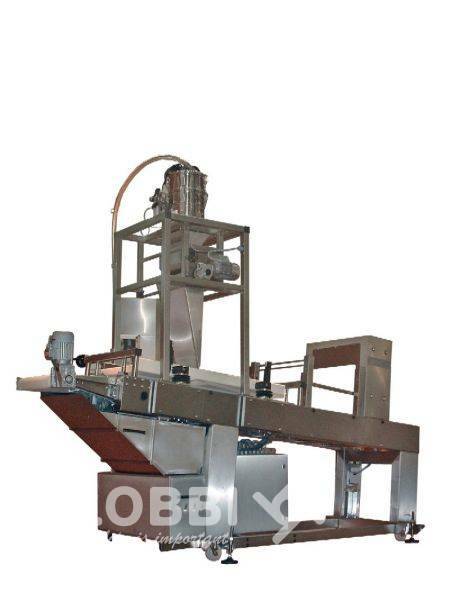 Due to its robust construction it is most suitable for use in industrial bakeries, either as an independent machine or as part ofan automatic production line. The VIPAVA RR is available in numerous versions, each designed to meet the specific characteristics of the dough being moulded into long loaves. In principle two basic versions can be distinguished – with or without the moulding head. This is used when the dough needs to be rolled into a thick foil before its final moulding. Both versions are available as a 2400 and 3000 model differing in the machine’s capacity. The VIPAVA 3000is available as well as an automatic machine with all settings performed automatically through an electronic control panele (PLC) – centering cylinders’ distance, moulding board’s height, moulding belt’s speed. Possibility of choosing the most appropriate moulding board and head for the specific technological characteristics of the products. Possibility of different sides of charging. Sturdy construction ensures a long life-cycle and possibility of intensive use. Easily accessible surfaces from stainless steel make the cleaning easier. The automatic version of the machine allows simple and quick product assortment changes.